"Nationally, Ford F350 trucks hold the top five spots," said Henry Tso, Vice-President, Investigative Services, IBC. In fact, it is the Lexus GX460 that stands out as the lone non-Ford vehicle as being one of the vehicles most stolen in Canada. When thefts are broken down by region, however, there are some interesting differences in the types of vehicles most likely to be taken. "In Ontario, thieves target high-end SUVs and trucks, including Chevrolet's Tahoe, Silverado and Suburban," continued Tso. "In Alberta, once again Ford's F250s and F350s dominate the list. In Atlantic Canada, the Nissan Maxima is stolen most often, followed by the Chevy Silverado and Jeep Liberty." Cars are stolen for many reasons, says the IBC. Once stolen, vehicles may be shipped overseas for resale, scrapped for parts, or used to commit another crime. It's also likely far more common than you may realize: there were almost 85,000 reported vehicle thefts last year, according to Statistics Canada, representing a six per cent increase from the previous year. Never leave your vehicle running when unattended. When parking your car, always close the windows and lock the doors. Put valuables and packages in the trunk, where they're out of sight. Keep your car in the garage at night. Also, to minimize the risk of identity theft, don't leave personal information in your glove box; take your insurance and ownership documents with you anytime you park your vehicle. 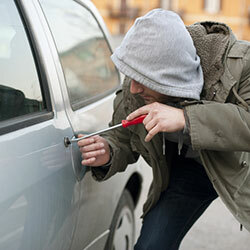 What does vehicle theft have to do with your car insurance premiums? Coverage for theft is included under the 'comprehensive' or 'specified perils' part of your auto insurance policy. It's an optional coverage and if it's included on your policy, part of determining your premium requires the insurer to assess the likelihood your car will be stolen. This includes a review of theft rates in your region and how likely thieves are to target your vehicle. However, each insurer's assessment will differ because they will also take into account their own claims experience. As a result, your premiums with one insurer may be considerably different than with another, which is why it's important to shop around for the best car insurance price.